One whose main interests are neither zoology or birds, could hardly imagine what lies hidden behind the walls of the Parc de Clères. At first glance it does not look as so it is home to one of the finest collections of pheasants and waterfowl in the world. When I first visited it in 2006, it fitted my idea of a typical French country estate, with a château, a manor house and landscaped gardens, which could have belonged to an aristocratic family. After walking only a short distance in the grounds of the Parc de Clères, however, one finally realises that it is much more than merely somewhere to take a casual "Sunday afternoon walk." The village of Clères is in the hilly part of northern Normandy, in northwest France. It is a drive of 40 minutes from the city of Rouen, which is famous for its cathedral and boat festival, called L'Armada de Rouen, which takes place there each year. For those who prefer travelling by rail, there are regular trains from Paris, with a change at Rouen main station. The Château de Clères was acquired by the late Jean Delacour in 1919 in order to house his bird collection. He had aviaries built in the gardens, some of which remain in use today, to display the numerous pheasants he collected during his many field trips to south-east Asia. He also collected many other tropical birds, including hornbills, fruit doves and other Asian softbills, as well as an impressive number of waterfowl, that he kept and bred at Clères. Parc de Clères was badly bombed during the Second World War and the collection was lost. Delacour, who had left France in 1940 to pursue his ornithological work in the USA, where he acted as a Technical Adviser at Bronx Zoo and worked as a Research Associate at the American Museum of Natural History, before later becoming Director of History, Science and Art at Los Angeles County Museum, opened the park to the public in 1947 and gifted it to the Paris-based French Museum of Natural History, in the hope of accelerating its rehabilitation following the war. Although Delacour continued to reside in the USA, he returned to Clères each summer until his death in 1985. Until 2008, the museum owned and administered the park, but it was clear that it did not have the funding and time to renovate the old aviaries and build new exhibits in order to attract more visitors. 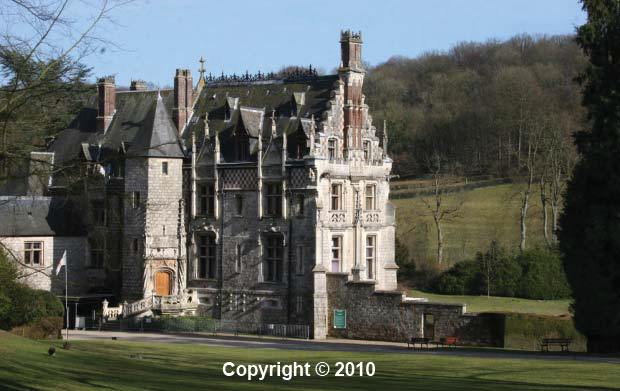 In early 2009, it was decided that the park should come under the administration of the Regional Council of Haute-Normandie so that the long-awaited development of the park could finally begin. It has made a start by building new aviaries to house owls, Madagascar birds and egrets; and to house lemurs. In addition, a number of other projects are being studied with a view to the park playing a major role in international wildlife conservation. Château de Clères for many years the home of Jean Delacour, President of the Avicultural Society 1972-1985. The Parc de Clères currently occupies an area of 70 hectares (approx. 170 acres), 13 hectares (approx. 30 acres) of which are open to the public. My favourite time of the year to visit Clères is in the spring, around about April-May, in order to see most of the ducks in breeding plumage and to try to catch glimpses of the nuptial displays of the pheasants. Arriving early in the morning, I chose to first have a look at the aviaries. On my way to them, I passed a breeding pair of White-cheeked Gibbons Nomascus leucogenys. The first of these gibbons to be kept in captivity in Europe were brought from what was then Indochina in the mid-1920s by Jean Delacour. Above their enclosure is a small row of aviaries housing PEACHFRONTEDCONUREPeach-fronted ConureGolden-crowned ConurePEACHFRONTEDCONUREPeach-fronted ConurePeach-fronted (Golden-crowned) Conures Aratinga aurea and White Cockatoos Cacatua alba. A short walk through a lovely garden, leads to the oldest exhibits in the park, which house the first of the pheasants, some waterfowl and other tropical birds. The particular way in which these aviaries are landscaped help give the park its charming atmosphere of being part of an "ancient French château," although it must be said that the aviaries do not always meet the occupants' requirements. Among the birds housed in these aviaries are a group of Pied Avocets Recurvirostra avosetta, a pair of the now rarely exhibited Mikado Pheasants Syrmaticus mikado, some Wonga Pigeons Leucosarcia melanoleuca, a pair of Fischer's Turacos Tauraco fischeri, a breeding group of Stone Curlews Burhinus oedicnemus oedicnemusBurhinus o. oedicnemus, some Ringed Teal Callonetta leucophrys, a few Northern Lapwings Vanellus vanellus, a Blacksmith Plover Vanellus armatusV. armatus, a pair of the Endangered Edwards's Pheasant Lophura edwardsi and the very rare Greater Brazilian Duck Amazonetta brasiliensis ipercutiri. From there I usually go to the smaller aviaries, located on the left-hand side of the complex, in which are kept medium-sized species of parrot, such as Derbyan Parakeets Psittacula derbyana, Green-cheeked Amazons Amazona viridigenalis, Grey Parrots Psittacus erithacus and Eclectus Eclectus roratus. Also housed in these aviaries are Red-billed Pigeons Patagioenas flavirostris flavirostrisPatagioenas f. flavirostris, a species not kept anywhere else in Europe, a male Ceylon Junglefowl Gallus lafayetii and one of the last San Blas Jays Cyanocorax sanblasianus kept in a European park. The path ends by an aviary built in 2008 to house a small group of Great Grey Owls Strix nebulosa lapponica. On the other side of the aviary is a grassy enclosure which was created in 2009 to display a young pair of Red-crowned Cranes Grus japonensis. This Endangered species is now much more common in European zoos than it is in Asia, but it is still hardly ever bred. Let us hope that this pair which only recently arrived at Clères produce many offspring for the European Endangered Species Programme (EEP). Another new exhibit is a walk-through aviary. It is nicely landscaped and houses a breeding group of the Critically Endangered Northern Bald Ibis Geronticus eremita, along with Little Egrets Egretta garzetta and Black-crowned Night Herons Nycticorax nycticorax. Then there is a large Madagascar exhibit which was completed in 2008. It houses Alaotran Bamboo Lemurs Hapalemur alaotrensis, the first lemurs to be kept in the park for many years. They have already bred, having first done so in late 2008 and then again in 2009. 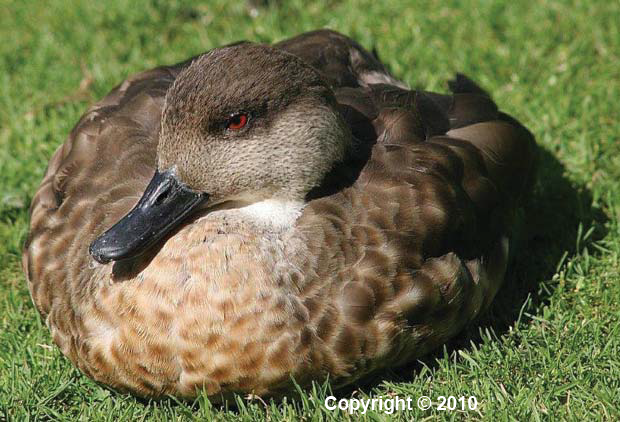 They live along with the Endangered Madagascar Teal Anas bernieriA. bernieri and Meller's Duck Anas melleriA. melleri, that were first kept there in the 1930s. It is odd that apart from Paris Zoo (Parc Zoologique de Paris, Vincennes), which has closed for extensive renovation, very few French collections have Madagascar exhibits, showing lemurs and birds, etc. On the other side of the narrow path is a row of medium to large aviaries used exclusively for keeping and breeding Galliformes. These aviaries have recently been landscaped and now have more plant cover and more perches available, which has led to improved breeding results, especially for rarer species such as the Crestless Fireback Lophura erythropthalma erythropthalmaL. e. erythropthalma, which is not shown anywhere else in France. There are also Great Curassows Crax rubra rubraCrax r. rubra, a pair of recently arrived Ocellated Turkeys Meleagris ocellata, a pair of Vieillot's Crested Firebacks Lophura ignita rufaL. ignita rufa and, most importantly, two pairs of the rarely seen Salvadori's Pheasant Lophura inornata inornataL. i. inornata from Sumatra. The park is famous worldwide for its breeding successes with both Edward's Pheasant, which is the subject of a European Endangered Species Programme (EEP), and the Vietnamese Pheasant Lophura hatinhensisL. hatinhensis, as well as with Salvadori's Pheasant which, for a long time, has not been seen in captivity anywhere else in Europe. Alain Hennache, Curator of Birds at Clères, Studbook Keeper for Edwards's Pheasant and (with Dang Gia Tung, Curator of Birds at Hanoi Zoological Gardens) joint Studbook Keeper for the Vietnamese Pheasant, is among pheasant experts investigating whether or not the Vietnamese Pheasant is a valid species. He has observed how Edwards's Pheasants hatched at Clères regularly go on to grow white tail feathers (a characteristic of the Vietnamese Pheasant) despite the fact that their parents are pure-bred Edwards's Pheasants. The investigation is continuing and could lead to a change in the taxonomic status of the Vietnamese Pheasant. Crested Duck Anas (Lophonetta) specularioides alticola. By following the main path, one arrives at the upper section of the pheasant breeding area. On the left is a huge block divided into approximately a dozen aviaries, each quite small, dark, and not very well landscaped. This very old exhibit will soon be demolished and new, bigger, more suitable aviaries built in their place. The present aviaries house more rarities such as (Berlioz's) Silver Pheasant Lophura nycthemera berlioziL. nycthemera berliozi (a subspecies described by Delacour & Jabouille 1928), which breeds very successfully at Clères and a large number of which are kept there, along with three other subspecies, namely Lophura nycthemera lewisiL. nycthemera lewisi (also described by Delacour & Jabouille 1928), Lophura nycthemera engelbachiL. n. engelbachi and Lophura nycthemera beaulieuiL. n. beaulieui (both described by Delacour 1948). Also housed in these aviaries are a pair of Himalayan Monals Lophophorus impejanus, some more Edwards's Pheasants, a pair of the now rarely kept Elliot's Pheasant Syrmaticus elliotiS. ellioti, a pair of (Honshu) Green Pheasants Phasianus versicolor robustipes, a male Palawan Peacock-Pheasant Polyplectron emphanum, a Lady Amherst's Pheasant Chrysolophus amherstiae, a pair of Temminck's Tragopans Tragopan temmincki and a pair of Blue Eared Pheasants Crossoptilon auritum - a quite common species in the past but now getting rare in aviculture, especially in France. There is a flock of Red-billed Pigeons, a Barred Cuckoo-Dove Macropygia unchall unchallMacropygia u. unchall, a group of Laughing Kookaburras Dacelo novaeguineae and a pair of Red-billed Blue Magpies Urocissa erythrorhyncha occipitalis, as well as a female Hume's Pheasant Syrmaticus humiae humiaeS. h. humiae, which following the death of the last male in 2008, is now the last specimen of this species in a public collection in France. Finally, there is a pair of Imperial Pheasants Lophura imperialisL. 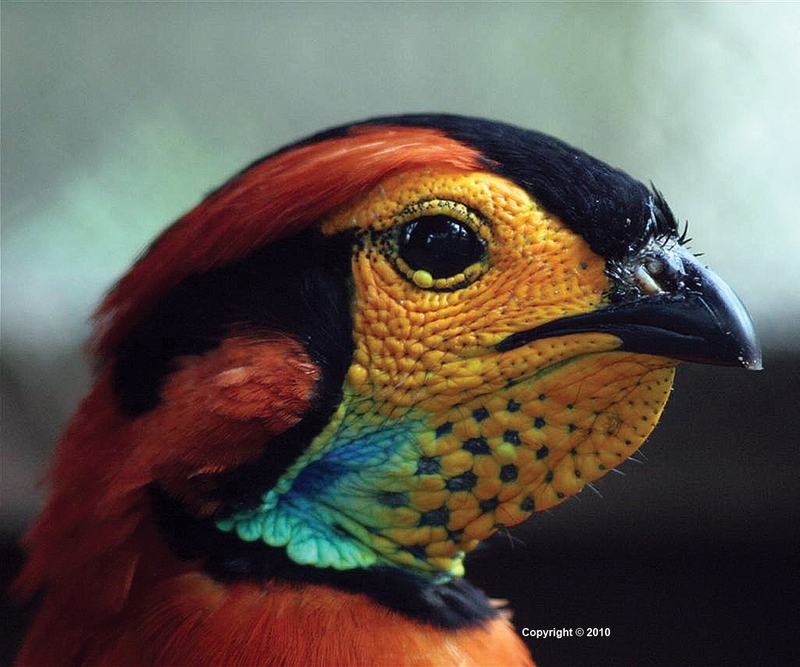 imperialis, a bird discovered by Delacour in Vietnam in 1923 (and described by Delacour & Jabouille 1924). The original two birds were brought to Clères, where they bred for the first time in 1925 and it was from this pair that the European and American populations were descended. 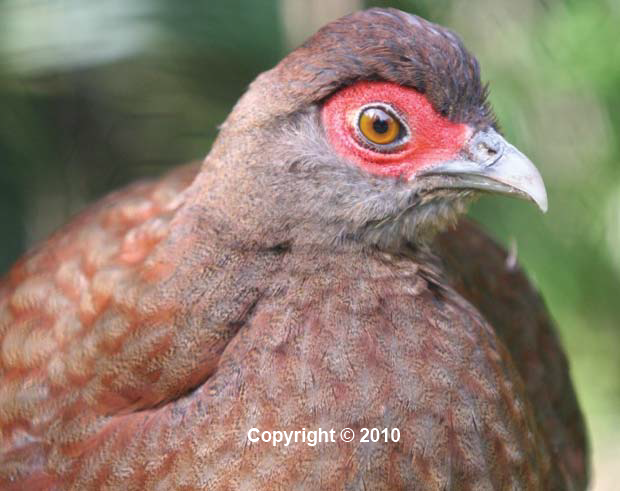 Modern research, however, suggests that the Imperial Pheasant is in fact a naturally occurring Silver x Edwards's Pheasant hybrid. Captive-bred Silver x Edwards's Pheasant hybrids match perfectly the few known Imperial Pheasants. The latter are almost impossible to find in captivity nowadays and the birds at Clères are probably the only known captive pair in Europe and, possibly, anywhere else in the world, at this moment. A grassy enclosure behind the above facility, houses a pair of Emus Dromaius novaehollandiae and Cereopsis Geese Cereopsis novaehollandiae. The final group of public aviaries are a lot larger and much better landscaped. The largest house waterfowl, such as Hooded Merganser Lophodytes cucullatus, Greater Brazilian Duck and the rarely exhibited Blue-winged Teal Anas discors, which are considered too delicate to be kept free on the large lake. On the other side there are a pair of White Eared Pheasants Crossoptilon crossoptilon drouinyiC. crossoptilon drouinyi (the only subspecies kept in European collections), a pair of Satyr Tragopans Tragopan satyraT. satyra, a pair of Temminck's Tragopans and a single male Cabot's Tragopan Tragopan cabotiT. caboti (a species being bred off-display at the park), as well as the rare Puff-backed Bulbul Pycnonotus eutilotus, a small group of Brush Bronzewings Phaps elegans, some Crested Quail-Doves Geotrygon versicolor and a few Crested Pigeons Ocyphaps lophotes. Most of the pheasant collection is not on view to the public. I was though once fortunate enough to visit the off-display area and recall seeing a pair of Cheer Pheasants Catreus wallichi, a male Ruffed Grouse Bonasa umbellus, which displayed in front of me for several minutes, some Grey Peacock-Pheasants P. b. bicalcaratumPolyplectron bicalcaratum bicalcaratum, a Croaking Ground Dove Columbina cruziana and the only known captive Blyth's Tragopan Tragopan blythiiT. blythii in France - the bird in question being an old male. The château used to house a delightful collection of tropical birds, including hornbills (the Great Buceros bicornis being the highlight), toucans and a few hummingbirds, but this is no longer open to the public. One may think, as I did during my fi rst visit, that most of the more interesting birds are to be seen in the aviaries, but after discovering the beautiful gardens and the area around the lake, I quickly changed my opinion. There is a really beautiful area with several paths leading up into a wooded area towards the back of the park, where there are Bennett's Wallabies Macropus rufogriscus, a herd of Blackbuck Antilopa cervicapra, some Chinese Water Deer Hydropotes i. inermis and lots of Blue Peafowl Pavo cristatus, including some white ones, roaming free. There are two different areas with ducks and other waterfowl, etc. The fi rst is an enclosed grassy fi eld with a stream and a small off-display area into which the birds can retreat and get away from the visitors. Usually, the first birds which come into view are the Demoiselle Cranes Anthropoides virgo, European White Storks Ciconia ciconia, a pair of Southern Screamers Chauna torquata and a breeding group of Sacred Ibis Threskiornis aethiopicus. Then, looking more closely and waiting patiently, one is likely to see Chiloe Wigeon Anas sibilatrixA. sibilatrix, Lesser Canada Geese Branta canadensis minima, now frequently treated as a subspecies of the Cackling Goose Branta hutchinsii minimaB. hutchinsii minima, Red-breasted Geese Branta ruficollisB. ruficollis, a large flock of Magpie Geese Anseranas semipalmata, White-faced Whistling Ducks Dendrocygna viduata, Black-bellied Whistling Ducks Dendrocygna autumnalisD. autumnalis and a single specimen of the West Indian Whistling Duck Dendrocygna arboreaD. arborea - a species almost never seen in French zoological collections. There are also Emperor Geese Anser canagicus, a pair of Ross's Geese Anser rossiiA. rossii, a single, now rarely seen, Ashy-headed Goose Chloephaga poliocephala, the Vulnerable Lesser White-fronted Goose Anser erythropusA. erythropus, a pair of Maned Geese Chenonetta jubata and a pair of the rarely exhibited Blue-winged Goose Cyanochen cyanopterus. Four, nearby, small grassy enclosures, each close to the water, house several species of duck, including a group of Spot-billed Ducks Anas poecilorhyncha poecilorhynchaA. p. poecilorhyncha, a breeding group of Falcated Ducks Anas falcataA. falcata, some Ruddy Ducks Oxyura jamaicensis, the Critically Endangered Laysan Teal Anas laysansensisA. laysansensis and a small group of Buffleheads Bucephala albeola, as well as Trumpeter Swans Cygnus buccinator. The lake and surrounding area are home to an extravaganza of waterbirds, which are joined sometimes by a few Blackbuck and peafowl, that are fed close by at the end of the day. For visitors, the most eye-catching of the waterbirds are, of course, the flamingos. The flock is composed mostly of hybrids, a mix of Chilean Chilean FlamingoPhoenicopterus chilensis, Caribbean Caribbean FlamingoPhoenicopterus ruber P. ruber and Greater Flamingos Phoenicopterus roseusP. roseus. They are free to roam, but usually remain out in the middle of the lake and come to the water's edge only at feeding time. The large, friendly flock of Hawaiian Geese Branta sandvicensisB. sandvicensis that breed each year, mingle with the visitors, begging them for food and sometimes, as happened to me, pecking at their clothing and shoes. The large flock of Bar-headed Geese Anser indicusA. indicus usually spend most of the day in the tall grass in a nearby fi eld and are best seen in the early morning and towards the end of the day. The pair of Greater Magellanic Geese Chloephaga picta leucopteraC. picta leucoptera is easy to spot and there is a small group of Greater White-fronted Geese Anser albifrons flavirostrisA. albifrons flavirostris and some Snow Geese Anser caerulescens caerulescensA. c. caerulescens. Some of the less shy ducks, such as the Chestnut Teal Anas castaneaA. castanea, a species not often encountered in French zoological collections, can often be found resting close to the main path. Most of the ducks stay close to the water and usually spend the day resting on the muddy bank, separated from the visitors by a low fence. There are Black Swans Cygnus atratusC. atratus, a group of Fulvous Whistling Ducks Dendrocygna bicolorD. bicolor, Barnacle Geese Branta leucopsisB. leucopsis, Ruddy Shelducks Tadorna ferruginea, a pair of Australian Shelducks Tadorna tadornoidesT. tadornoides and a single male paired with a female South African Shelduck Tadorna canaT. cana, as well as a large group of Common Shelducks Tadorna tadornaT. tadorna and a lone female Radjah Shelduck Tadorna radjah radjahT. r. radjah. There are many Wood Ducks or Carolinas Aix sponsa and Mandarins Mandarin DuckA. galericulataAix galericulata, Eurasian Wigeon Anas penelopeA. penelope, Gadwall Anas streperaA. strepera, a small group of Baikal Teal Anas formosaA. formosa, some Common or Eurasian Teal Anas crecca creccaA. c. crecca, a large group of Speckled (Chilean) Teal Anas flavirostris flavirostrisA. f. flavirostris, Cape Teal Anas capensisA. capensis, a pair of Yellow-billed Ducks Anas undulataA. undulata and some more Spot-billed Ducks. The single, rare specimen of the Pacific Black Duck Anas superciliosa pelewensisA. superciliosa pelewensis, is a bird I had never seen before. Other waterfowl living on and around the lake, include Northern Pintails Anas acutaA. acuta, a large group of White-cheeked Pintails Anas bahamensis rubrirostrisA. bahamensis rubrirostris, Silver Teal Anas versicolorA. versicolor and the closely related Puna Teal Anas punaA. puna, Cinnamon Teal Anas cyanopteraA. cyanoptera, a species rarely seen in French zoological collections, three pairs of Philippine Ducks A. luzonicaA. luzonica, a female Red Shoveler A. plataleaA. platalea, a breeding group of European Shovelers A. clypeataA. clypeata, a male Hottentot Teal A. hottentotaA. hottentota, some Marbled Teal Marmaronetta augutirostris, a large group of Red-crested Pochard Netta rufina, Rosybill N. peposacaN. peposaca, Common Pochard N. farinaN. farina, Tufted Ducks Aythya fuligula, Lesser Scaup Aythya affinisA. affinis and the two subspecies of the rare Crested Duck, namely Anas specularoides specularoidesAnas (Lophonetta) s. specularoides and Anas specularoides alticolaA. (L.) s. alticola. A pair of Buff-cheeked Gibbons N. gabriellae live in the trees on an island in the lake and plans have been made to introduce a group of Ring-tailed Lemurs Lemur katta. Living in three grassy enclosures by the water are Reeves's Muntjac Muntiacus r. reevesi, Black Crowned Cranes Balearica pavonina pavoninaBalearica p. pavonina and a further pair of White Eared Pheasants. I was struck by the amazing diversity of the Anatidae collection and was especially pleased to see the Crested Ducks, which are so rarely seen in French zoological collections. I was also impressed by the way in which so many of the species are identifed right down to the correct subspecies. There have been difficulties in the past, but good progress is now being made at the Parc de Clères, and the spirit of Jean Delacour continues to live on. Situated in the Normandy countryside, it provides a good insight into the history of captive bird keeping and breeding and an enjoyable day out away from the noise and hustle and bustle that are all too often part of modern day life. I would like to thank Dr Alain Hennache and all the keepers who welcomed me to the park and answered all my questions. Their valuable help was very much appreciated and the writing of this account of my visit would have not been possible without their assistance. I would also like to thank Josef Lindholm, Senior Aviculturist at Dallas World Aquarium, whose insights, guidance and kind words helped and encouraged me to write about my visit the Parc de Clères, as well as to other collections around the world, which will be the subjects of articles in future issues of the magazine. Pierre de Chabannes lives at Le Chesnay in France.